Well – Happy Thanksgiving to everyone out there! I will be celebrating this all-american holiday like most people – by drinking too much and consuming a large meal consisting of 10% protein and 90% carb fest. Did you know the typical thanksgiving dinner has around 3,000 calories? And that doesn’t even count the alcohol… for shame! Oh, well – it tastes good anyway. 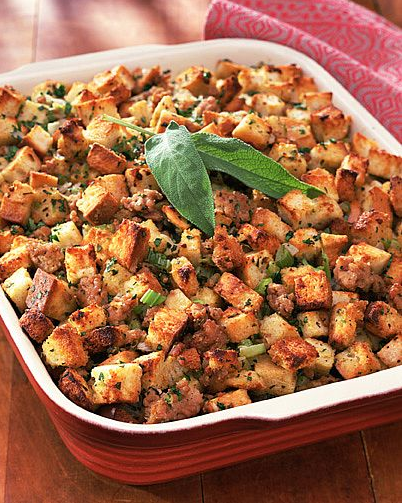 I posted a picture of stuffing instead of the ubiquitous image of the golden turkey because I don’t even like turkey that much, but I looooooooove stuffing. In fact, give me a large plate of stuffing and a couple of glasses of wine, and I’m set, thanks.